San Vicente de Colonche is a small rural village of 300 on the Santa Elena Peninsula of coastal Ecuador. The sole sources of water available to this village are an adjacent irrigation canal or the unacceptable option of spending a significant portion of family income of $250 to $300 per month to purchase water from a vendor. Even with purchase, the purity of the water is uncertain. The Municipality (local government) has broken promise after promise to provide the citizens of San Vicente with safe drinking water. The Rotary Club of Santa Rosa and the Santa Rosa East Rotary Club agreed to partner with First Presbyterian Church of Santa Rosa to install a water treatment system in San Vicente. The appropriate technology, a very simple, inexpensive and easy to operate and maintain system, has been developed by Living Waters for the World, a Synod of the Presbyterian Church U.S.A. The system, capable of providing 350 gallons per hour, consists of a series of four progressively finer filters, followed by UV disinfection. The Rotary Club of Santa Rosa contributed $1500, Santa Rosa East contributed $1000, and First Presbyterian Church contributed the remaining $2500, a total of $5000, for materials for the project. All of the labor to construct the structures and the system was provided by the villagers themselves. Some villagers were also trained in the final installation, operation, and maintenance of the system, which still requires permanent electrical power and a supply line from the canal to the treatment system. The Municipality has actually begun the work on the electrical transformer and the supply line, which will be finalized in the next few months. Bob Swift of First Presbyterian Church will follow up via emails and a personal visit to ensure that the system is completed and up and operating. 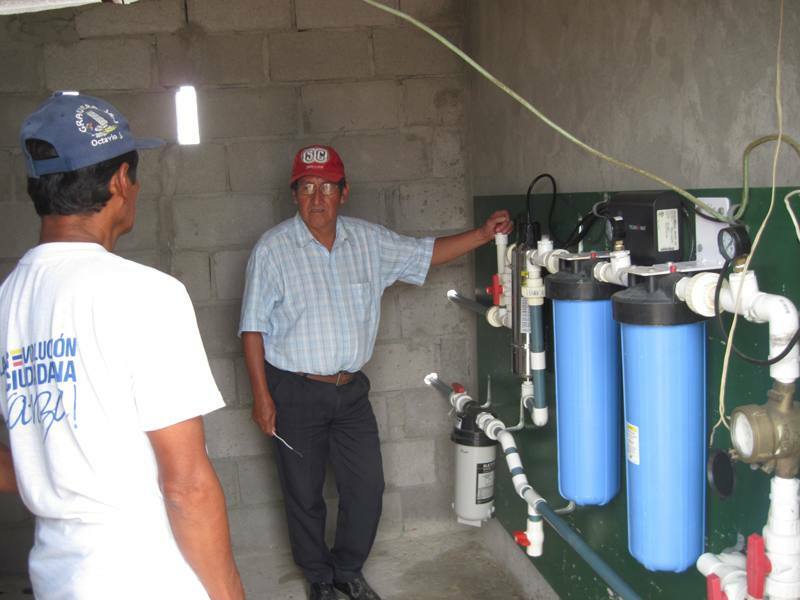 Because of this sustainable appropriate technology (inexpensive, easy to understand, operate and maintain) the village of San Vicente will soon have a safe and affordable drinking water supply.